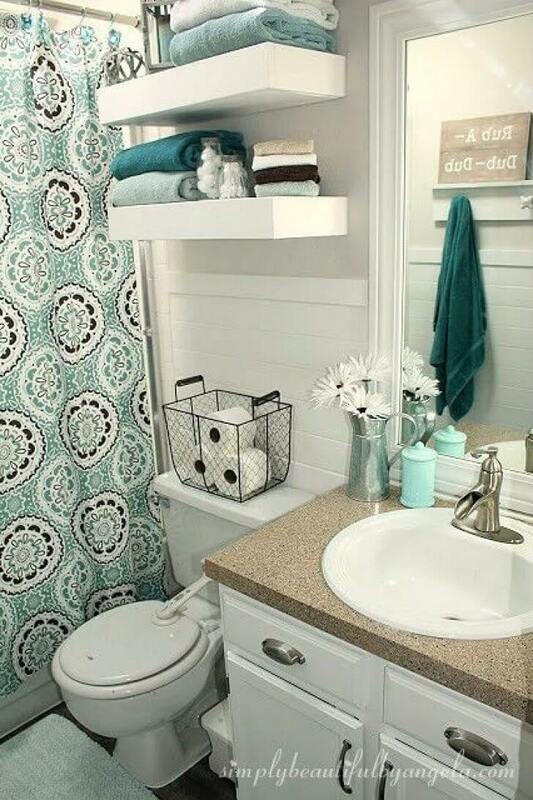 Bathrooms never seem to have enough storage space, especially if you live in a smaller house or apartment. With toiletries, towels, bathroom tissue, and more to store, the often tiny under the sink cabinet just can’t hold it all! Not to mention trying to decorate to give your bathroom a more homey feel. That’s why we have compiled 32 crazy smart over the toilet storage ideas to make the most of your space. Want to keep each family member’s stuff separate? Try one of the many solutions featuring individual baskets and bins. You’ll never hear the dreaded “Mom, where’s my . . .?” again! From modern minimalist to farmhouse chic, this list has ideas that fit every decorating style and bathroom size. 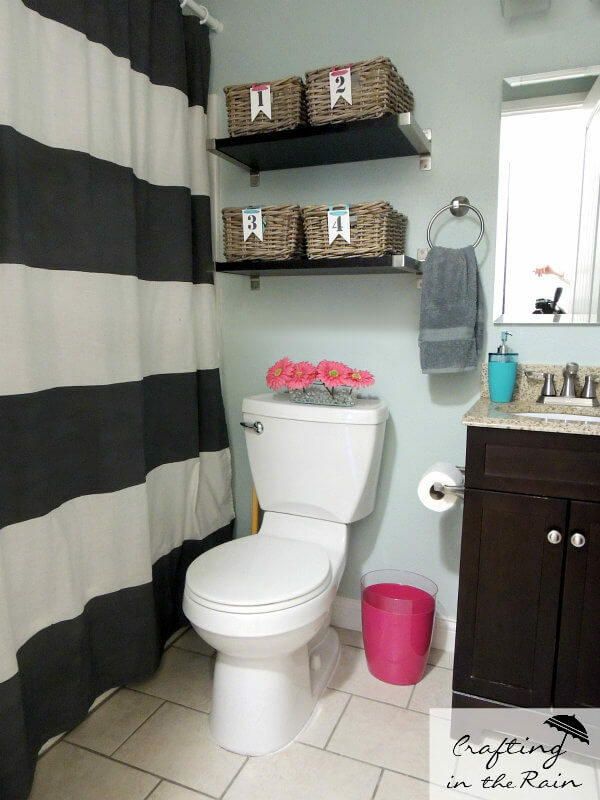 Keep reading for more information on all 32 of our over the toilet storage ideas! 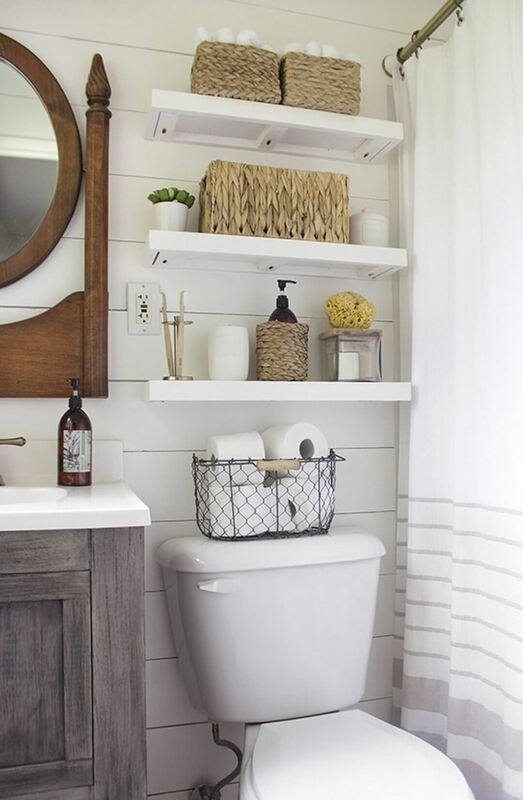 Clean white shelving that is inset with lighting brings both light and focus to over the toilet storage as well as sufficient storage space on each shelf. It adds height, depth, conciseness and positioning room for placement of natural bath accessories and other basics for bathroom use. Wired and roped baskets hung above a toilet area make for quick and easy access to hand towels and washcloths, and a small hanging shelf anchored above the baskets can easily hold decanters of body washes, shampoos and conditioners that can be retrieved before a shower or bath. This is an inexpensive way to quickly set up a storage area with a few simple everyday items. 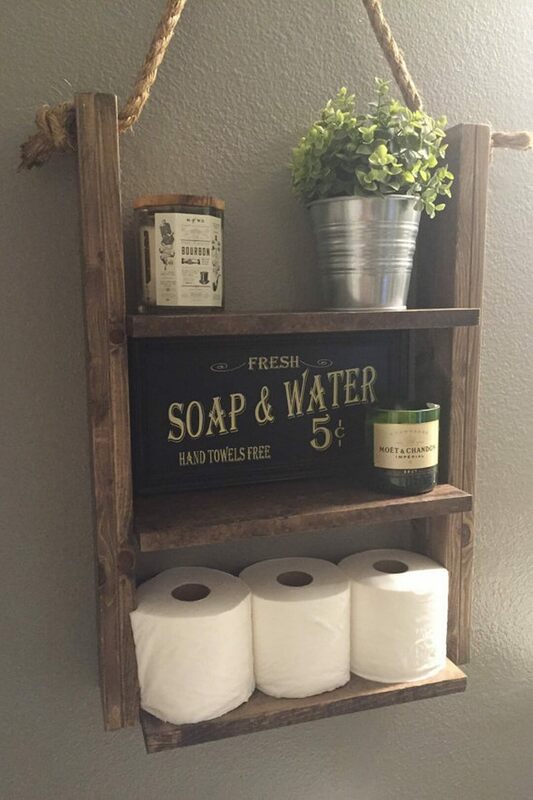 An old-fashioned barn wood look can bring rustic character to over the toilet storage. 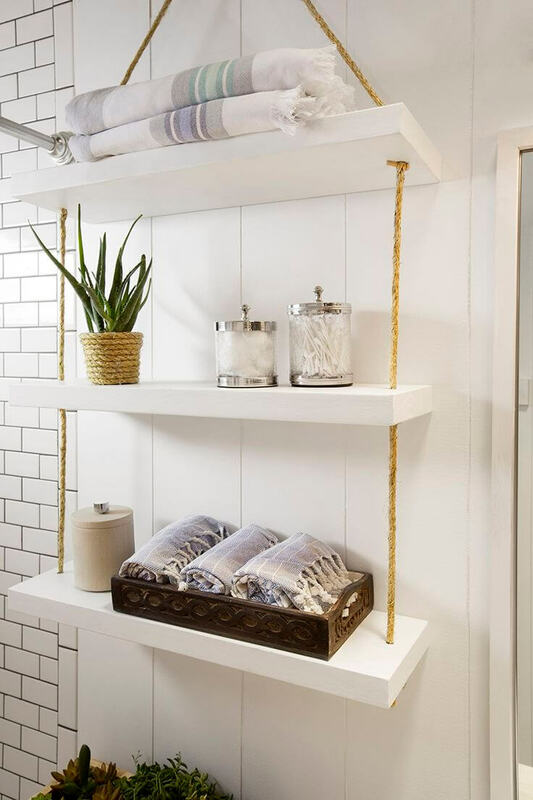 The shelves are sturdy and secured by thick rope and the shelves can hold both necessities and coordinating accessories for the style of the bathroom area. 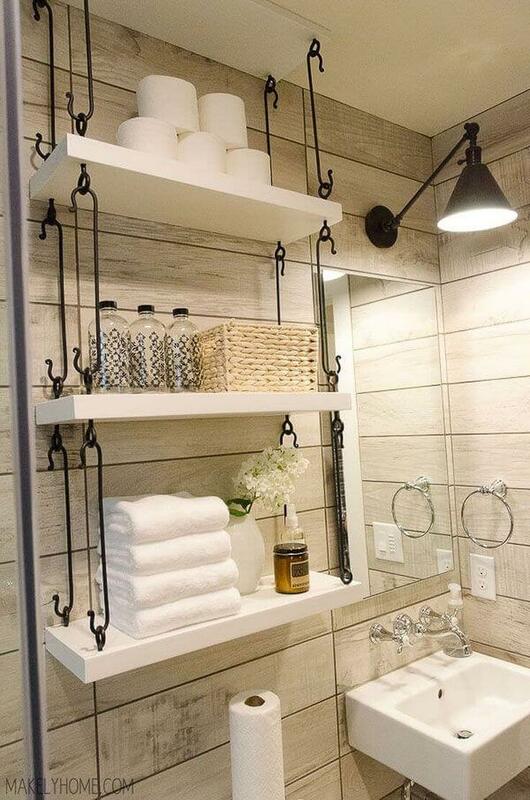 Industrial pipe makes sturdy holders for rustic wooden planks, creates easy access and allows for towel stacking and placement of bathroom essentials along with accessories for bathing and showering use. This storage idea would be a fairly easy hardware store project for almost any do-it-yourselfer. There are a number of ways to use open and closed wrought iron or mesh metal containers. 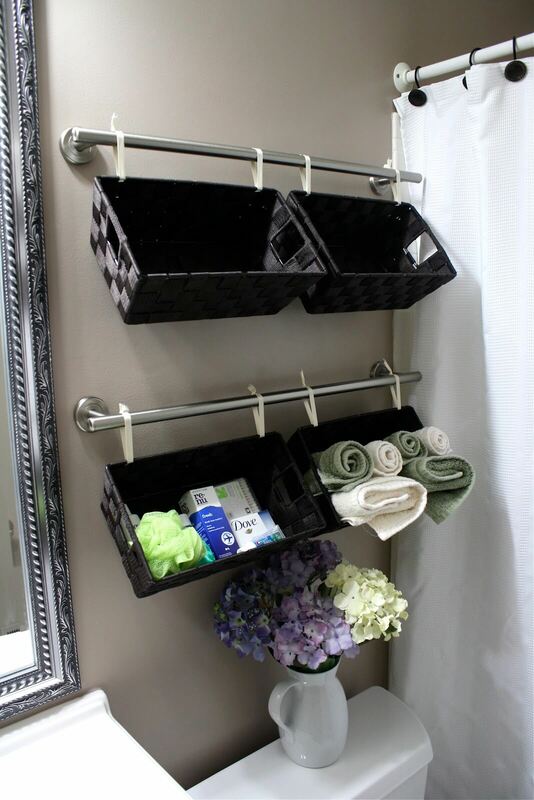 Containers with an attached towel bar can easily accommodate small towels or wash cloths. Small open wooden crates or boxlike containers can hold paper goods and other toiletries. Any of these metal containers can be hung on a side wall, over a toilet, or put directly on the toilet tank lid for retrieving essentials. 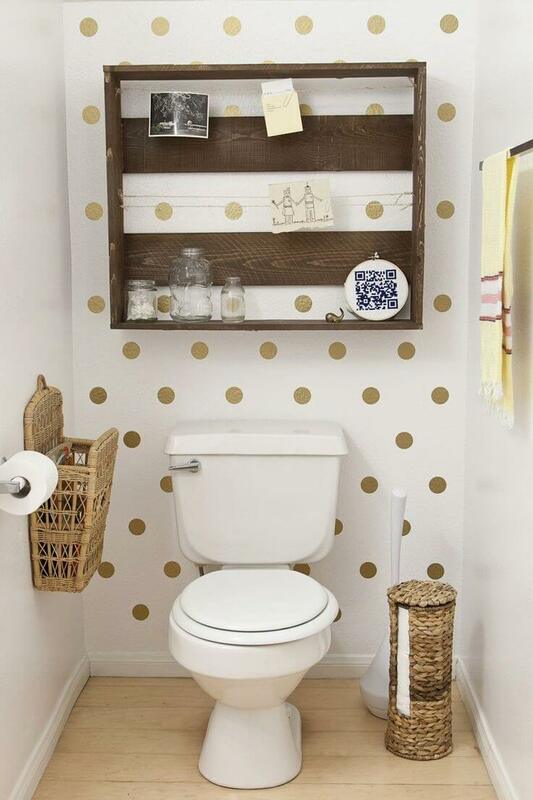 Wooden distressed shelves placed on dowels or pegs are another easy and quick way to set up storage over a toilet area. The shelving can easily be whitewashed or painted with chalk paint colors to give it a traditional or countrified appearance. A hanging shelf with eye rings and long insertion hooks is another fast, easy and attractive way to put shelving together. Though anchored to both a back wall and an overhead ceiling, the shelves appear to be floating, which gives it a freestyle look that can be coordinated with any bathroom décor and bath essentials. Fabric containers from home, department or discount stores make great receptacles for storing items, and they can be easily hung or tied directly to an existing towel bar or towel bars for a fast and easy access to towels, toiletries, medical necessities and anything else for shower or bath needs. Towel bars, individual shelving, baskets, candle and soap holder/dispensers are all great ways to break up a more solid look that shelving can sometimes project. A degree of separation can bring a more distinctive and individualized look to an over the toilet area. A wooden wall plaque with shelving can be used to make a decorative statement as well as provide for everyday functions. 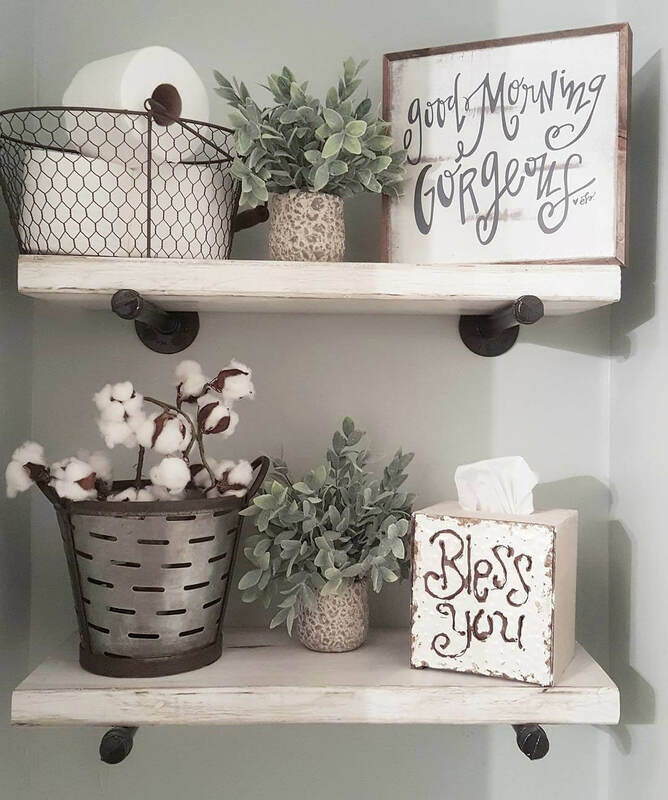 Displaying a favorite family photo, plants and varying knickknacks is easy to combine with bathroom necessities that can be easily retrieved from either shelf. 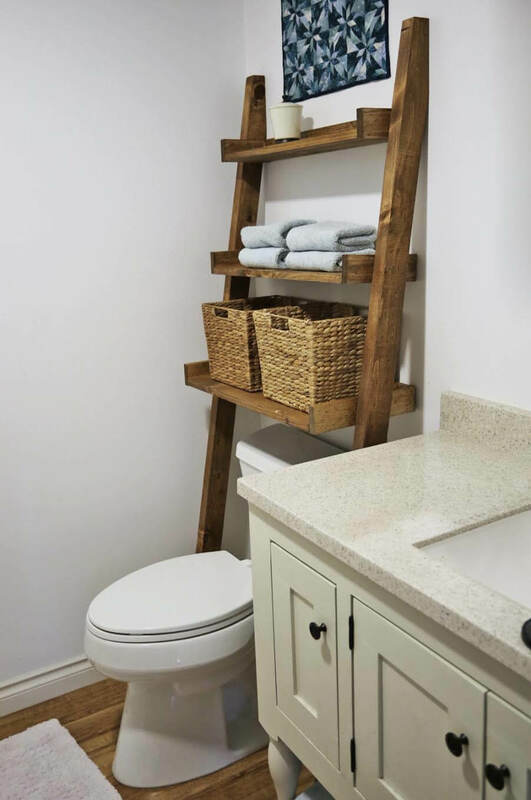 Ladder shelving is simple to place over a toilet area as it doesn’t take up flooring space around the toilet, plus the shelving or rungs can be made wide enough to hold a number of different items, such as baskets, towels and other containers for toiletries. Numbered baskets are a good way to identify bathroom necessities, and sturdy and reinforced shelving at different levels can be reached for access by users. The baskets can easily be moved and adjusted for replenishing bathroom towels, tissues and toiletry products. 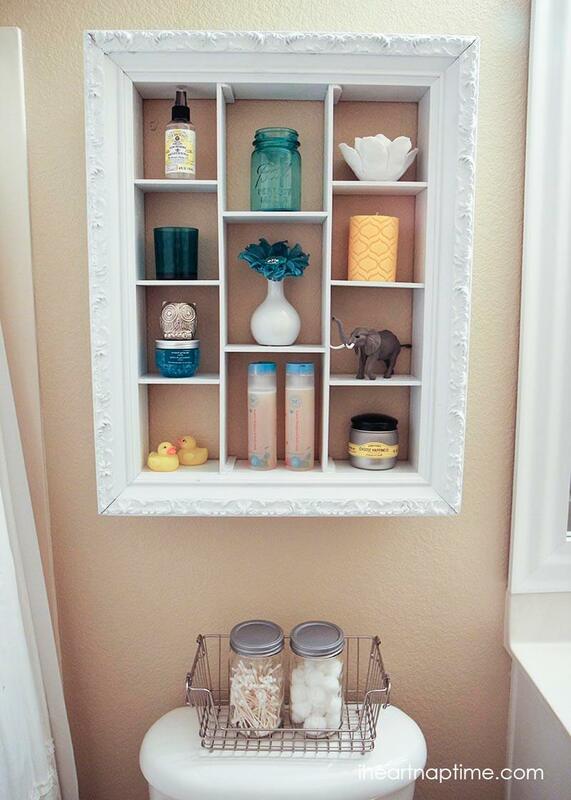 An ornate frame outline with shadow box inset shelves can bring an old-fashioned decorative look to a toilet area. Openings allow for placement of all kinds of bathroom products as well as positioning of mementoes, bath toys for children, candles and figurines. 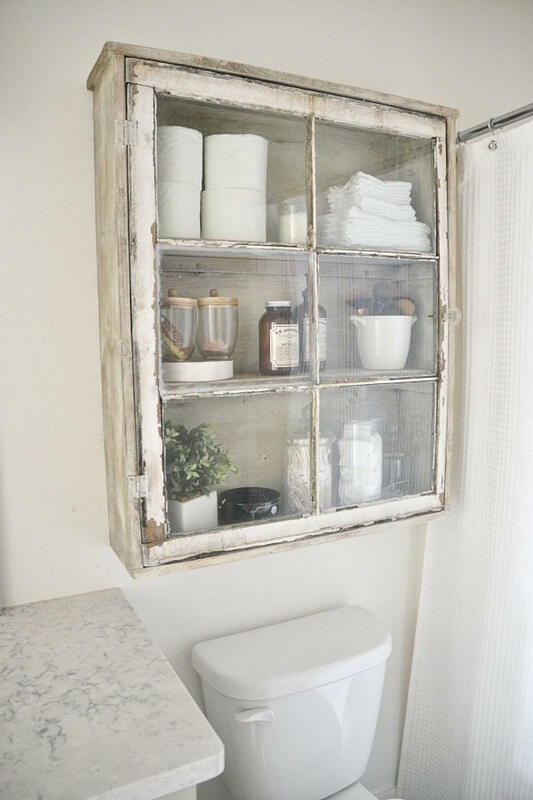 A rustic and distressed cabinet with windowpane glass fronts and a doorknob opening is a stylish and organized way to house bathroom necessities. Also, a cabinet can help protect any items within it from exposure to dust, moisture and possible breakage or damage. 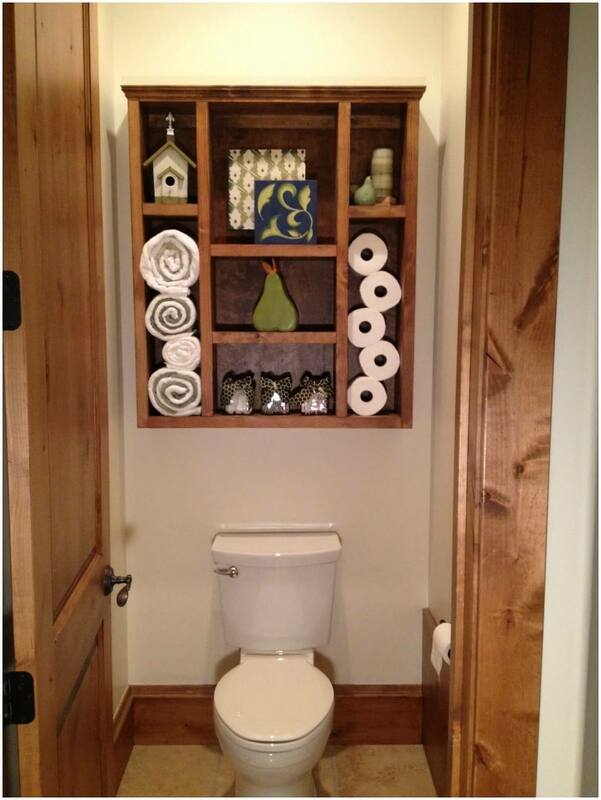 Graduated open shelving in rich wood can add not only color and depth to over the toilet shelving, but it also allows for more decorative aspects in between wall spaces. 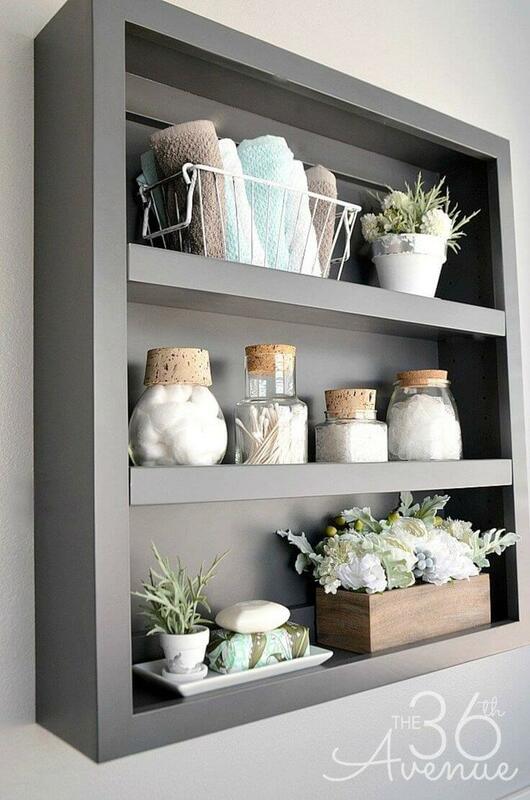 There is not only room for bathroom staples, but the shelves can be used to display any number of collectibles, figurines, flowers, plants or bath decanters. 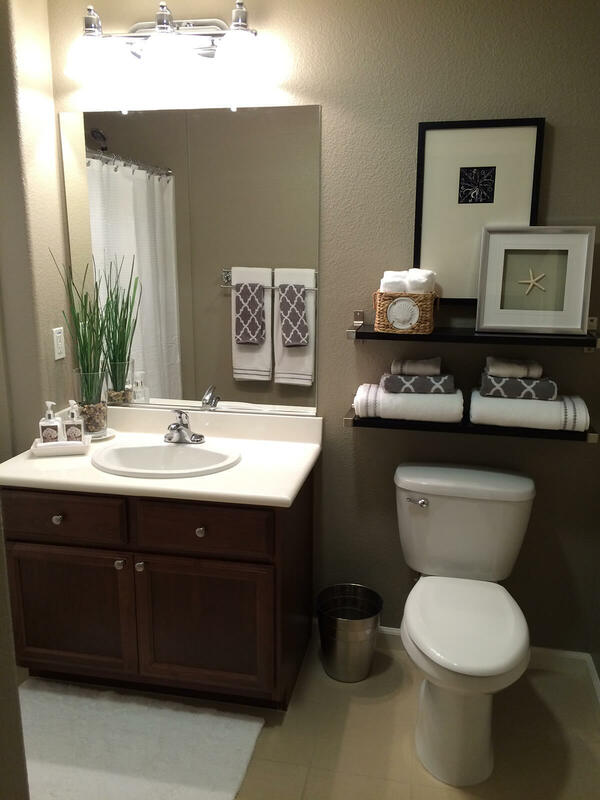 Even a shelf on top of the toilet tank can be utilized for bathroom accessory groupings. Bracketed shelving that is positioned at lower levels over a toilet area gives quick access to towels and other bathroom essentials, plus it allows for height to display pictures and other items that can help elongate a wall behind a toilet area and draw the eye in an upward fashion. Squared off and boxy shelving affixed directly to a wall in a toilet space can give a floating or hanging effect that is interesting visually, and it provides sufficient room for thick towels and other bath items. A toilet tank topper like the open metal tissue holder adds extra storage and added texture. 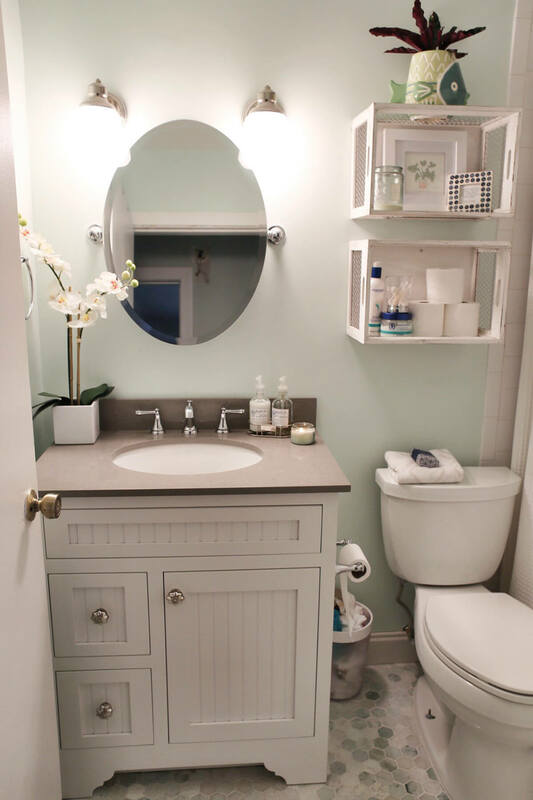 Closed shelving that matches and coordinates with more traditional mirrors, vanities and medicine cabinets brings a more finished look to a toilet space and adds a sense of privacy to a bathroom area. Most anything bulky, awkward or breakable can be easily organized and stored without having to worry about disarray and other issues. 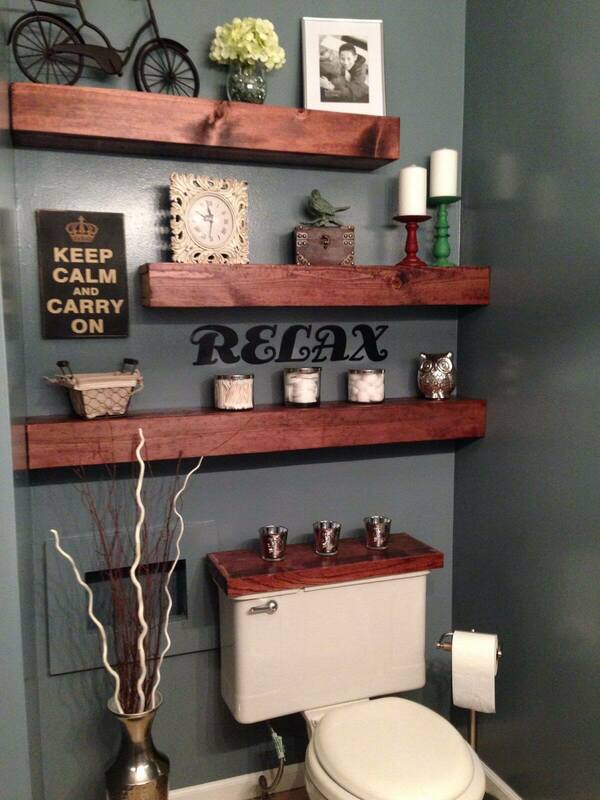 Wooden shelving creates a homier look in a toilet space. When shelving is located at a higher level, the items displayed can be easily seen and appreciated, particularly when bath towels are mixed with decorative items. Larger baskets on tank lids create a third shelf look and provide storage for bath tissue and toiletries that are easy to access. 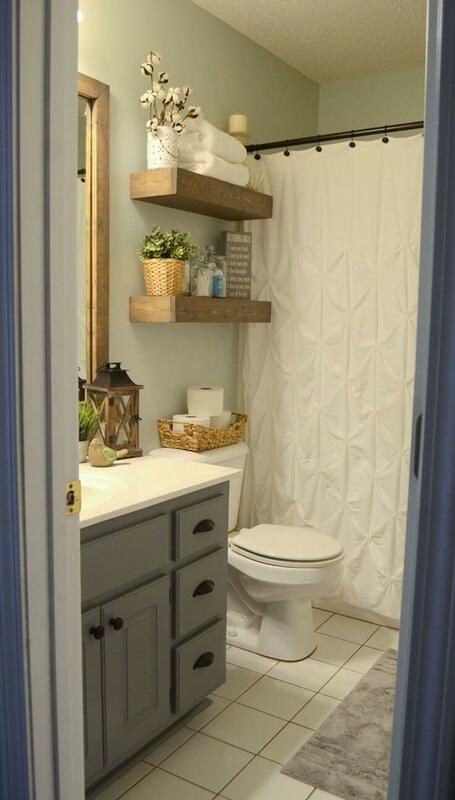 An open box or crate effect can be a different and attractive way to create over the toilet shelving. There is room for regular bath basics as well as pictures, vases and knickknacks that go along with the bathroom design or personal decorative taste. 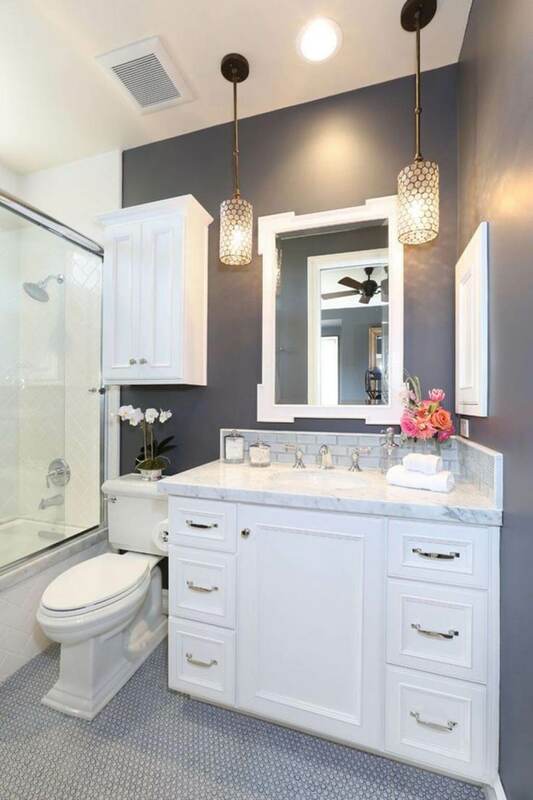 Large painted shelving that harmonizes with other bathroom colors, fixtures and cabinetry can enhance a bigger bathroom toilet area and make it appear fuller. Each shelf section can accommodate a number of bathroom items as well as other decorative pieces. 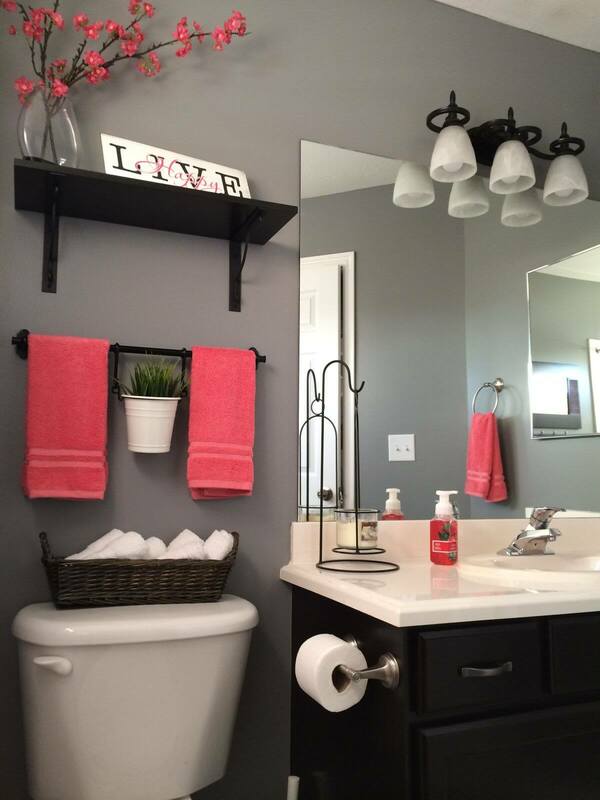 A wire hand towel holder in a neutral color adds to the look. Over the toilet shelving can create a whimsical look when it is paired with the right wall paint or coverings. 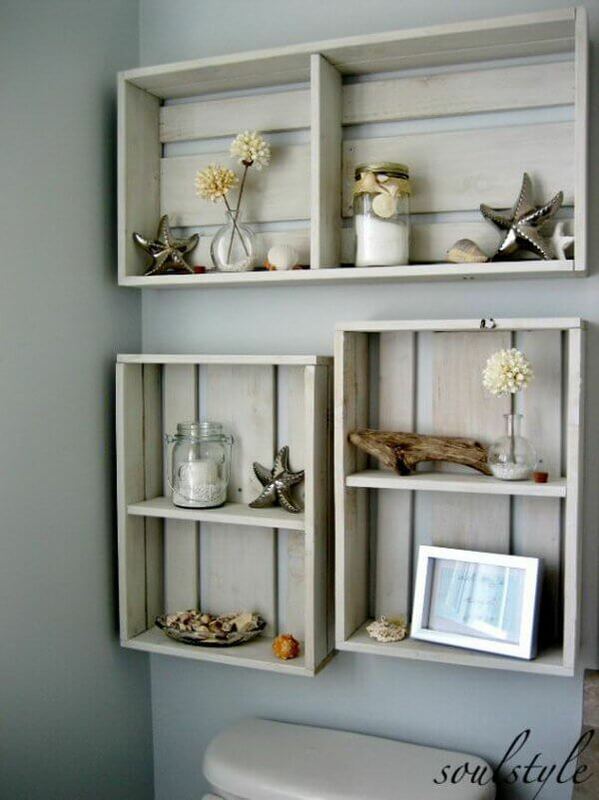 A wooden shelf with slats or backboards allows for hanging and displaying hand drawings, pictures, post cards and notes along bath items on the bottom part of the shelf. 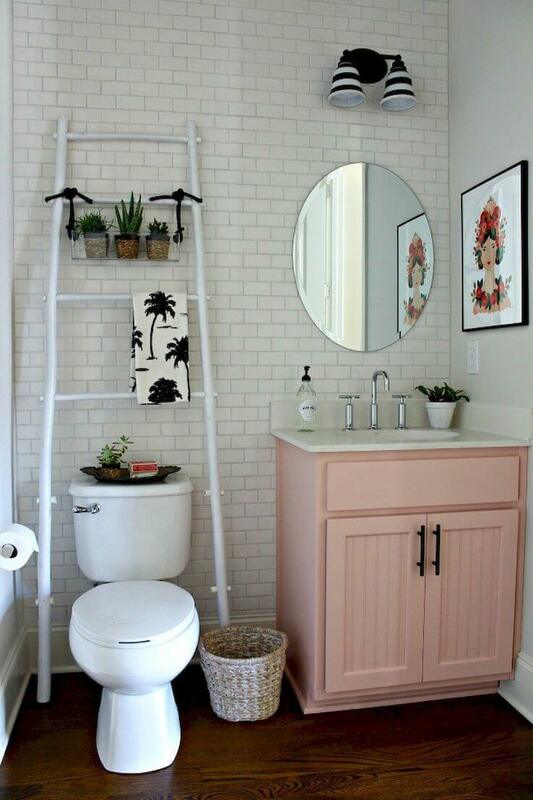 A narrow, long and unassuming ladder type of shelf can add height to a toilet space and detract from the plainness of an area. 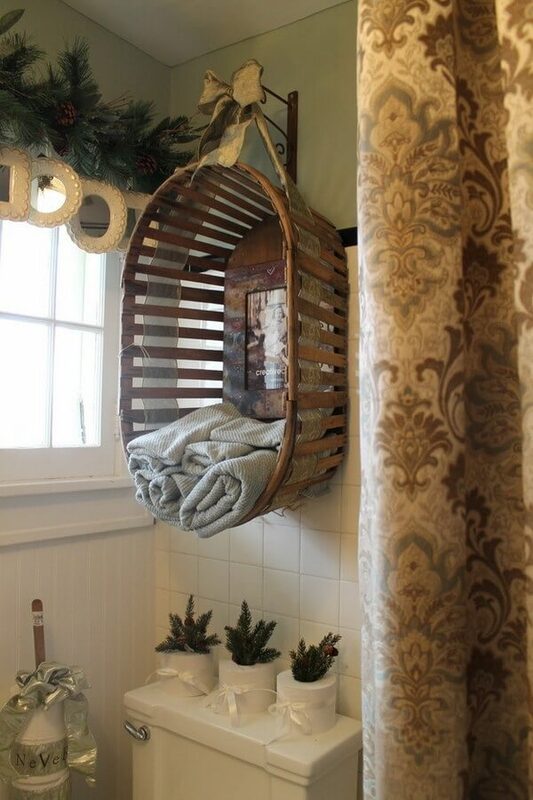 There is ample room for hanging larger towels and smaller ones as well as decorative plantings tied to one or more of the rungs. It is a nice look for a bath area with little space and higher walls. Large, thick and dark wooden shelves that are attached to a wall inset add to the texture and depth of an overhead toilet area and when the right combination of bathroom accessories and decorative items are utilized, the area pops out and appears as though it is a separate space. Hanging shelves with rope insertions generate a relaxed and free feeling and look good in just about any setting, but are geared for a seaside cottage or other casual abode. 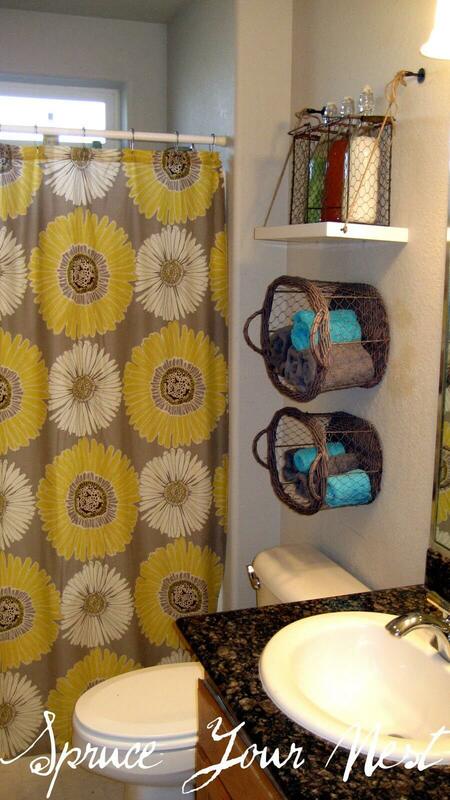 Their openness allows for placement of towels, towel containers, baskets and other bathroom basics. Open wooden shelving that resembles crates with large slats is one other way to achieve a casual look above a toilet space. Reversal of horizontal and vertical positions of the shelving slats creates a nice vignette and allows for an open display of favorite treasures and mementoes as well as any added towels or bath accessories. 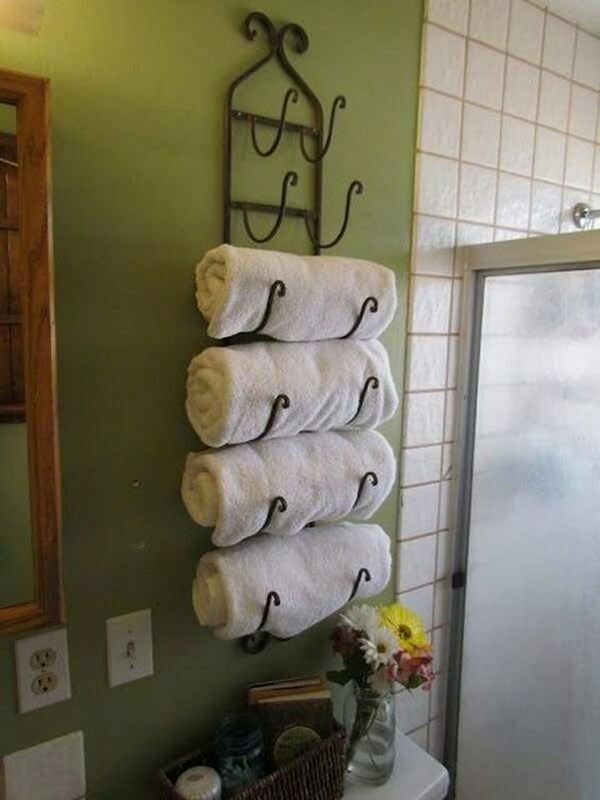 Towel roll racks are another easy and fun way to store and display towels, and they can create both a casual and elegant look with the right selections. Many have a sculpted appearance in dark metals or take on a more modern look with straight lines in chrome or stainless steel. Either way, they hold a towel nicely and are easily accessed from the shower or tub. Colored or galvanized metal pails tied to a towel rack with added drilled holes are a great way to store almost any kind of toiletry or bath accessory. They are colorful and fun and would go well in a child or teen’s bathroom as they are on a lower level and are easy to reach into, plus they hold as much if not more than an actual shelf. This is another hardware or home store project that is easy and fun. Children love digging into pails as do teenagers and adults. A large old-timey laundry basket with open slats is a great substitute for a larger shelf. It can be easily mounted on a decorative bracket and loaded with towels of most any size, and it can be used to display an old or new photograph on the basket bottom. Decorative additions for the holiday season add a festive touch with intertwined ribbon and a topper bow along with the addition of pine boughs above the basket and on the toilet tank top. 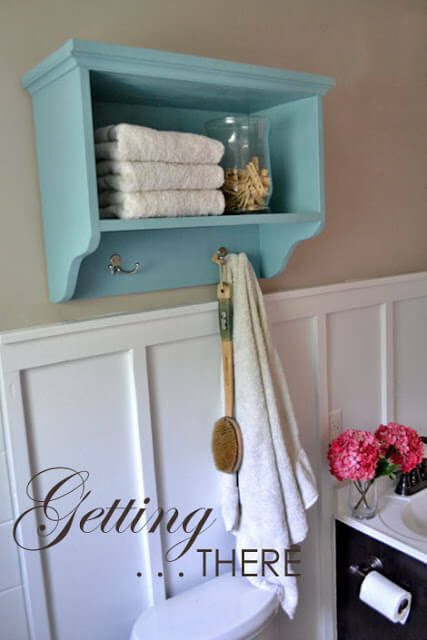 A colorfully painted single shelf with an underneath section that contains hooks for hanging towels clothing and bath essentials is an attractive addition to a smaller bathroom where there isn’t a lot of wall space or room in general. It can be easily accessed for both sink and tub use and offers a nice contrast with the white wood half wall. 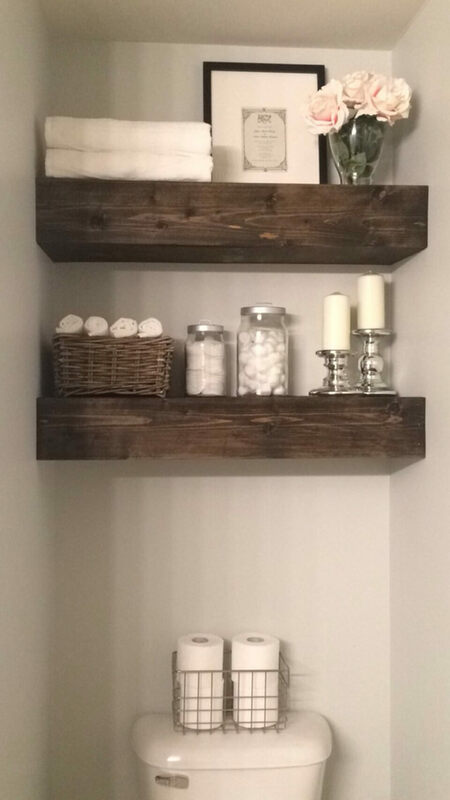 A wood sectional shelf divided into different size openings is a great way to display any number of items for decorative and bath use. One side can house rolled towels while the other is perfect for extra toilet paper rolls. 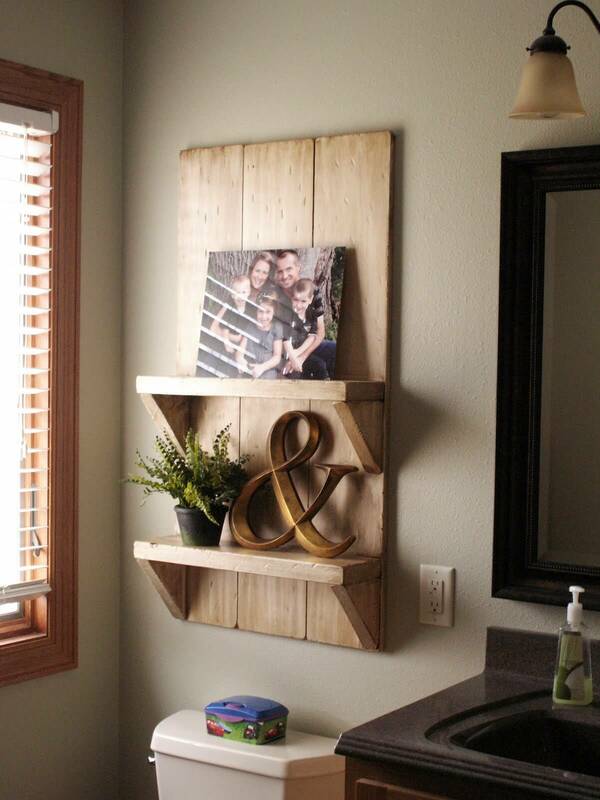 A shelf used in this way makes it a perfect focal point upon entry into a separate toilet area.